Looking for unforgettable heroes pitted against unbeatable odds? 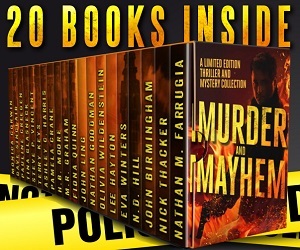 Fans of Lee Child, James Patterson, Gillian Flynn, Paula Hawkins, and John Grisham will love the USA Today and Award-Winning authors in the MURDER & MAYHEM boxed set, which is why the authors of this collection came together to bundle 20 EXCLUSIVE thrillers and mysteries, including plenty of BRAND NEW material! 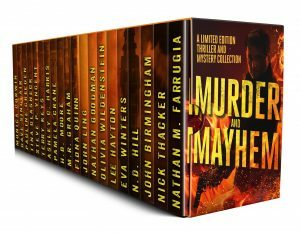 This unbeatable lineup of stories will spike your heart rate and blow your senses with thousands of pages of clever crimes, devastating murders, heart-pounding mystery, and psychological twists. From tales of spies and espionage to small-town mysteries and traditional courtroom thrillers to hard-boiled noir, this collection offers a cross-section of modern thriller and mystery. Scroll Up Now and Pre-order Today to secure your 20 stories from the masters of thrills and kills!